Microsoft PowerPoint is a delight when it comes to creating state of the art presentations. With more than 30 years in the market, PowerPoint literally holds a monopoly when we talk about impressing the audience with slides. The persuasive and detailed features of PowerPoint are what makes it viable for presentation enthusiasts. The stronghold in the presentation domain maintained by the Microsoft PowerPoint remains un-shattered. Now, one of the common pitfalls is that people often screw-up the user experience. An absence of good design, lack of engaging content and no dominance of visual content are making presentations dull and not so interesting. An array of organizations from start-ups to full-fledged companies begin and end their business endeavours through PowerPoint presentations. Conferences, business strategy sessions, business situations and outline plans are incomplete without PowerPoint support. The presentation software is used by many in both, corporate and academic world. Making of progress reports through roadmap as well as timelines slides is crucial for every business meeting. In a nutshell, PowerPoint is an absolute presentation package which can help you deliver a presentation to an audience of any type. Why Are Predefined Presentation Templates Beneficial? Using PowerPoint for making presentations is great. But, most of the time presentations often miss the “Wow” factor and fail to appease the audience. What comes as a fascinating fact is that you can always get your hands on a never-ending library of graphics and pre-tailored PowerPoint templates. SlideModel is providing a quality alternative to your presentation slides requirement. The experts at SlideModel understand that people often don’t have expertise in the design. Creating visual-rich presentations is difficult and it is appreciable to consider presentation templates from this platform. Hence, if you’re looking forward to a place where you can find templates for your diverse presentation requirements, SlideModel is your pick. If you’re a presentation enthusiast, you’d be delighted to know that the platform has several dedicated categories which will help you pick the best slide. If you want templates, you can simply stroll over to PowerPoint Templates. If you’re looking for graphical add-ons, you can go to Diagrams, Shapes and Maps, respectively. Let’s talk more about the major pros of ready to use templates available at SlideModel.com. If you’re simply making a presentation in PowerPoint like rest of the people, you’re confining yourself to the same set of tools and options. Customization is minimal in that respect. You can’t just limit your creativity and make an ordinary presentation which will further fail to impress your students, clients or peers. Making presentation optimal as per the requirement requires customization. SlideModel.com offers 100% editable slides which can be altered as per your respective needs and helping toward making effective presentations and slide decks. You can add or remove the element as you like or edit the text placeholders. You can even change the colour theme while keeping a constant & pixel-perfect design. Rejuvenate the creativity in you and produce the best of presentation in no time. Experts designers at SlideModel.com have made sure that there is the availability of slides for enthusiasts from every domain. 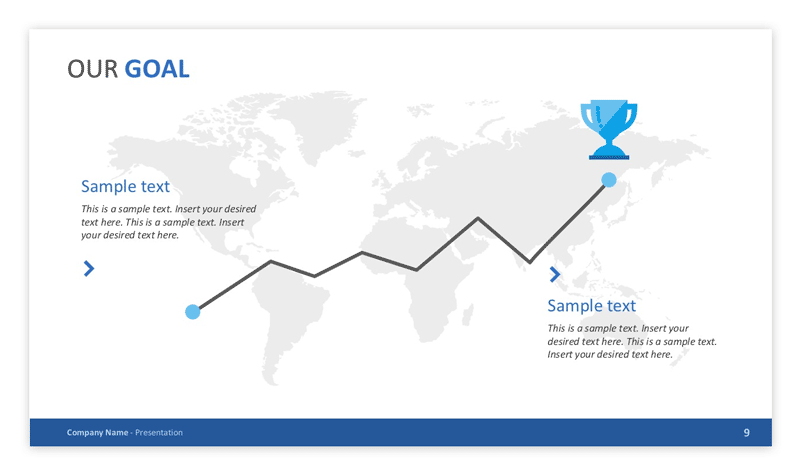 It doesn’t matter if you want presentation slide support for your corporate presentations or you want to aid your college project presentation, SlideModel has the right template for everybody, and if the template is not available in the content catalog, you can suggest it via their Support Center. An unparalleled support through high-quality graphics, editable maps, templates and more have been given for all. If you are in the corporate world, using pre-defined templates can help to leverate the possibilities. Imagine you need to convince a group of investors to invest in your product or business and raise capital using a slide deck. Using 100% editable slides could help to prepare company presentations in minutes. 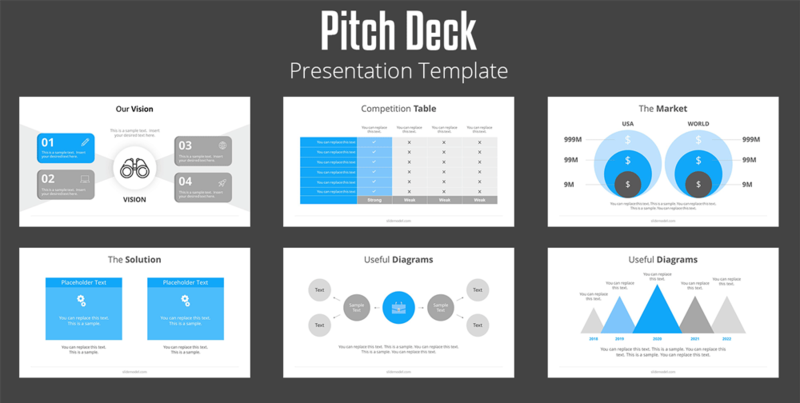 Recommended Reading: Learn how to create an effective Pitch Decks with PowerPoint templates. Creating a visual impact and gaining your audience’s focus is easy with SlideModel. Include images, videos and audios as per your professional and personal requirement. Be a presenter which who is creative and informed. Know your options and leverage the content sharing capabilities. With SlideModel’s PowerPoint shapes, you can get access to signs, symbols and clipart which can help you ace your endeavours. This is great news for people missing the old Microsoft Cliparts that were removed from newest versions of PowerPoint. A higher degree of flexibility has been assured by the platform. You can change the properties of elements as per your wish. Make alterations in gradients, colours, shadow effects quickly & efficiently. Impressing the clients is what, a PowerPoint presentation is all about. Inculcating templates with illustrated shapes can be helpful. From Country Flag, Medical, Cartoon clip arts to flying balloon, labyrinth head concept type shapes, everything is available at the platform. The unparalleled support for data and charts has been provided which can help the user break the ordinary and complex data into something meaningful and grasping. What comes as an additional benefit is that SlideModel is highly compatible with dedicated and premium tools like Keynote, Google Slides, OpenOffice and much more. You can leverage the potential of SlideModel online through Google Slides and can make presentations on the go. Share the templates with your colleagues and students with added ease. One can even do online UI/UX prototyping with SlideModel’s templates. Thus, a diverse support has been ensured for users amidst all platforms. If you’re on Mac and use Keynote for making presentations, no worries, you can still make use of 100% editable templates provided by SlideModel.com and import them into Keynote without hassle. If you’re really enthralled by the beauty of templates and associated features at SlideModel.com, you can get them once you subscribe. The platform is offering dedicated subscriptions based on a user’s customized requirement. You can get access to the pool of awesome presentation templates for just one time. You can even unlock an unlimited access with the superior subscription. The site is easy to use. Literally, in a few seconds, anyone can find the platform pretty useful and can equip their presentations with a competitive as well as innovative edge.